Things have sure been better in this kitchen. An unfortunate football accident put me in a boot and crutches for a couple of months. It is now quite difficult to do many things… no running (farewell, Brooklyn Half Marathon), no picking things up that I can’t sling over one shoulder, the list goes on. One of the few things I can still do without (much) help, is cook. Thank goodness. 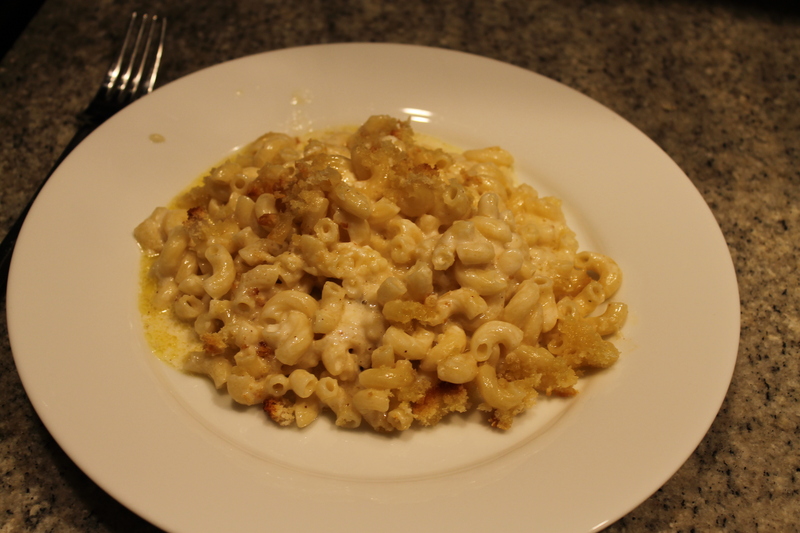 So what better to warm the soul than a big batch of homemade mac & cheese. Put a large pot of salted water on your stove for the pasta, drizzle some oil in as well. Once it comes to a boil, cook the pasta according to the instructions on the box — about 7 minutes. Now for the bechamel. Heat up the milk in a large saucepan on the stove until it is scalded but not boiling. In a separate saucepan, melt the butter and add the flour. Whisk until the flour is entirely incorporated and slightly “cooked”. Add the hot milk and whisk for another few minutes until it is thickened and smooth. Off the heat, slowly add the grated cheese, 1 tbsp salt, the pepper and nutmeg and stir until smooth. Add the macaroni and stir until incorporated. 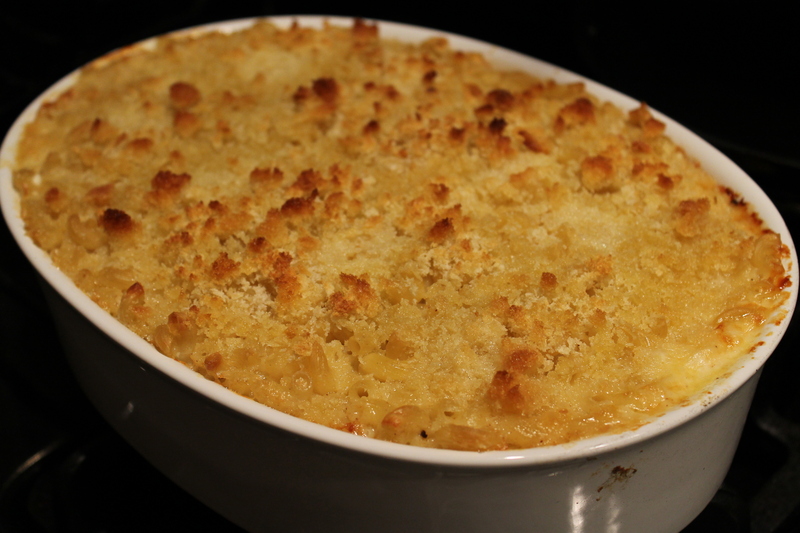 Pour the mac into a large 3 qt baking dish, top with fresh breadcrumbs (you can make these by cutting the crusts off 5 slices of white bread and blasting them in the food processor) and two tbsp melted butter. Bake for 30-35 minutes or until browned and bubbly. This entry was posted in Comfort Food and tagged Barefoot Contessa, cheddar, comfort food, dinner, gruyere, Ina Garten, macaroni & cheese, pasta. Bookmark the permalink.